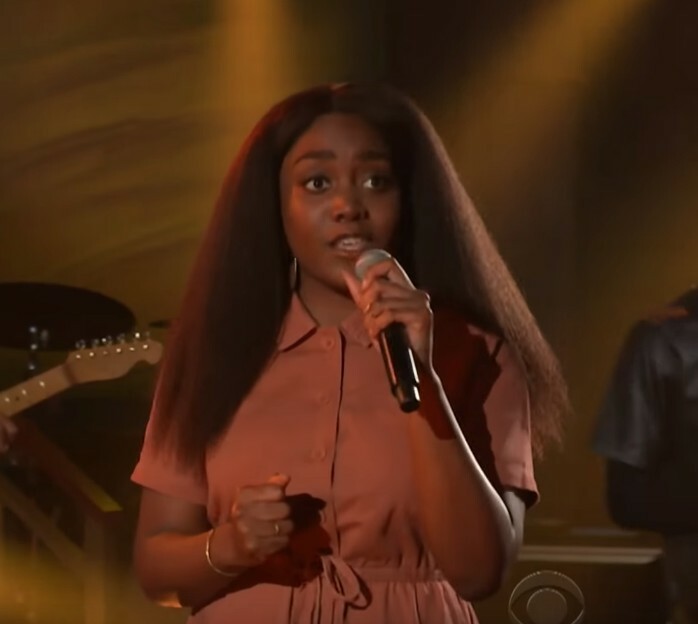 Noname made her solo TV debut last night on The Late Show with Stephen Colbert. The gifted lyricist brought three songs from her critically acclaimed album, Room 25, to life for the New York studio audience. Performing renditions of “Blaxploitation,” Prayer Song” and “Don’t Forget,” Noname delivered a powerful performance. The performance begins with a palpable energy that you can see flowing through the band and Noname as they begin fast, capturing your attention from the moment the lights dim. The accompaniment of her frequent collaborators Phoelix and Brian Sanborn as well as her backup vocalists created a church-like atmosphere allowing the band to shine. The medley featured every aspect of Noname that we love, her lyrically prowess, metaphor layered testimonials and rapid breakdowns of the complexities of life. Hopefully this isn’t Noname’s last TV performance and we can get to see more beautiful live adaptions of her songs. Watch Noname’s incredible medley below and give us your impression of the live performance in the comment section!